Author: Richard Denham and M.J Trow. I got this book for free in exchange for an honest review. I got this book from T. Squared Books. First of all l would like to say a big thank you to Richard Denham and M.J Trow for sending me this book and giving me a chance to read it. I would like to say a big thank you to T. Squared books for letting me be apart of their book reviewing team. This book has 210 pages in it. 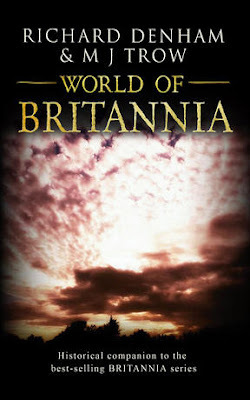 Synopsis: World of Britannia forms the historical background to the 'Britannia' trilogy the arrival of Rome's legions, first under Julius Caesar, then aulius plautius in the first century is well documented, but the end of roman rule in Britain remains forever in shadow, ' illuminated' only by contradiction and legend. The action of the Britannia series spans the period 367 – 425 AD, the beginning of what historians, with some justification, used to call the dark ages. It was the twilight of a civilisation that had lasted for nearly five hundred years and Britain would never be the same again. This book documents the little we know, from written records and from archarology and gives a snapshot of a world that was on the brink of vanishing. This book is an invaluable accompaniment to the series, providing insights that are not possible in his historical fiction as a standalone history book, it provides a fast-paced, easily-understood account of one of the least known eras in British history, ' but we must not forget and we must not let our children forget or our children's children! ' forget what? She frowned. ' that there was a wall and there were heroes of the wall. and there was once a Britannia. Review: I found this book really easy to get in to and hard to put down once l started reading it. It did not take me long to finish this book. I normally do not read about history but after reading this book l really enjoyed reading about history. I really enjoyed reading this book and about Britannia and Romans. I really liked the pictures in this book. I was hooked on this book after reading the first few pages. I can not put in to words how great this book is I would tell people to read this book for themselves to know how great this book really is. It was nice to read about the different gods and names. They was called. I reviewed this book on goodreads, amazon UK and US and my blog and I also took a picture of this book and shared it to my Instagram that l made for pictures of my books it is called donnareviewsbooks. When l was reading this book I would put some essential oils in my humidifier and put the lights on and chill on my bed and listen to magic or spotify or something on TV or netflix. I also put my christmas lights on that are on my christmas tree it is so relaxing. I like reading about all the treasures that are being unearthed and that there are graves being found all over. This book is great and l would happily read it again and again. I am sad to finish reading this book l would love to read more from these authors and more about history. I wish this book did not finish because it was a great read and it was exciting book to read and sometimes l would light a candle when l was reading this book. I got this book in paperback but it is available in other editions I have another book fro M.J Trow l am super excited to read it. I loved reading this book. I wish there was a follow on from this book. It is really nice just to relax with a good book as specially when you are in pain with arthritis or feeling ill. I been reviewing books for over two years and I have read so many great books. About The Authors: M.J Trow (the 'M' as most people know stands for Meirion, a welsh name few can manage, so he writes as M.J, is known by all and sundry as Mei, rhyming with 'My') has been writing for many years, with his first book – the adventures of inspector Lestrade – being published in 1984 by Macmillan. More Lestrades followed and then some true crime and somehow it all snowballed so now he has many historical biographies and three other crime series (Maxwell, Marlowe and Grand and Batchelor, the latter two written with his wife, writing as Maryanne Coleman, though her name is Carol, actually!) to his credit. He claims to be retired, but that is just from teaching. In fact he has never been busier and is sought after 'ghost' these days as well as historian and novelist, with many different subjects' stories having been told through him. He has recently started collaborating on fiction projects ( with someone other than his wife, that is) and finds it a really exciting and pleasurable experience. To relax he... actually, that's a bit tricky, as he does not really ever relax. He has been know to garden, he is a keen cook and artist and likes to travel. This is rather easier these days as he is a popular speaker on cruise ships – in fact his profile picture was taken on a very gusty day in cape town, setting off on a long voyage home to Southampton through some of the scariest seas he and his wife have had the pleasure to meet! It really was the calm before the storm, despite being a force 9 just leaving the bay. Family is important and he is very proud of his wife, Carol ( aka Maryanne Coleman) for her own books and also the ones they write together, the Kit Marlowe series. His son, Taliesin, know as Tali, is a writer who has written a biography of the tudor explorer Martin Frobisher as well as collaborating with Mei on several biographies. An exciting series is in the melting pot at the moment and will hopefully be appearing soon; remember where you heard it first. Tali is also a musician, playing various instruments with some acclaimed bands; Gemma Hayes, the coal porters, circulus and currently acid-folk ensemble the lords of thyme. He also records and tour-manages. His crystal vocals enhance everything he does and it is just as well someone in the family can sing, as it is the first thing anyone asks a welshman!. Richard Denham is the co-author of the popular 'Britannia' series with M.J Trow. These books follow a group of soldiers and their descendants through the madness of a chain of events which will eventually lead to the fall of roman Britain and the descent in to the dark ages. About The Book: I really love this bookcover and that it is a picture of a sky and clouds. It is nice that the font is yellow and white because it makes the writing stand out more. I like the font.